Welcome to the series where I go over every match that I gave ****+ to in each month of the wrestling calendar. May 2018 was crazy. We had the best of the super juniors, and a ton of great indy shows. I’ve got 61 matches from three continents and 23 different companies. I’ll also have my top ten wrestlers of the month down at the bottom of the article. Alright, time to see what the best matches of May 2018 were. Follow my twitter @rasslinratings where you can see my ratings for every match I’ve watched this year by clicking the link in the pinned tweet, as well as my constantly updated wrestler of the year top 25. Just days after putting on a match of the month contender challenging for All Japan’s Triple Crown title, Marufuji returned to his home promotion of NOAH to challenge for the GHC Heavyweight Championship and put on another incredible match. These two pulled out all the stops, from Marufuji’s breathtaking kick combos to a piledriver on the apron from the challenger. Marufuji sold tremendously in this match, and Sugi put him away with the same front choke that won him the title in a match with Kenou that I gave ****3/4, speaking of which, Kenou comes out post-match and sets up a rematch for the “Navigation with Emerald Spirits” show on 6/26. With Keith Lee leaving for WWE being pretty much confirmed since EVOLVE’s first WrestleMania weekend show, making this a title match really telegraphed the finish, yet these two pulled out all the stops to make me think Lee was actually going to pull the upset at times. There was a lot of the no sell/kick out at one stuff that bothers some people, but in the context of this match, I thought it worked perfectly. Riddle hitting ground zero on Lee made me pop big, and the champ finished off Lee with one of his brutal looking knees. Post-match Shane Strickland came out to make the challenge. These two have faced off many times in the past in PWG, PROGRESS, and other promotions, and they played off those past interactions perfectly with the “these two know eachother so well” story. Zack Sabre is probably my favorite wrestler in the world, and when he caught Ohno in a triangle as Ohno was going for a moonsault I nearly lost it. Sabre avoided the Death Blow and locked Ohno in the European Clutch for the win in the best match of the tournament. Afterwards, Sabre said he would take his title shot at the Wembley show. These two have one of the best rivalries going in the world today, and while I would not call this one of their best matches, it was still incredible, and the best match of the tournament until the final with Takahashi and Ishimori. They went almost 20 minutes at a crazy pace with great near falls as Hiromu kicked out of the desnucadora and Dragon kicked out of the dynamite plunger. Lee got the win over his arch0rival with a double stomp, followed by a spanish fly, followed by the phoenix-plex. Tremendous match. This lived up to their banger from the NJPW/RevPro Global Wars UK match late last year and was Ishii’s first defense as the undisputed British champ. Lee used his size to dominate early and when Ishii hits the Ishii driver later on in the match he can’t make the cover. The last five minutes of this match are filled with bombs and kick outs at one. Ishii even kicks out of Ground Zero, one of the more protected moves in independent wrestling. A second Ishii driver keeps Lee down for three. A must watch match and my women’s match of the year up to this point. Shirai bloodied up Momo in their match earlier this year that I had at ****1/4, but Momo fought back, winning the Cinderella tournament to get a second chance at beating her mentor. Io is just flat out better early on and gets a little cocky before Momo starts to take advantage and brutalize Io’s neck including a running dudebuster where it looked like Io took the bump right on her neck. Momo goes for it again off the top rope but is countered. Watanabe eventually gets the win with a bridging wrist clutch suplex (again right onto the neck). This will be Io’s sendoff as she is headed to the WWE. STARDOM has lost Kairi and Io in the past year or so, and it will be interesting to see how they book going forward. Ospreay is arguably the best wrestler in the world, and he showed why here. They told the story of Ospreay trying to hold onto his spot as the junior ace against the former junior ace, KUSHIDA. Ospreay went through both of the other members of the Wrestle Kingdom 4-way earlier in the year, and this was his last challenge before Best of the Super Juniors and boy was it a good one. KUSHIDA targeted the neck and hit a DDT on the apron and just stomped down on the neck Bryan Danielson style. They tease a ref stoppage but Ospreay powers up and hits the super OsCutter and the Storm Breaker for the win. Post-match Ishimori comes out to set up their night 1 BOTSJ match. 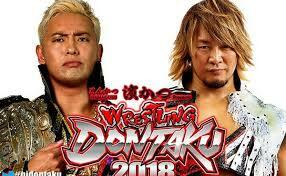 The tiebreaker match between these two as they are tied 4-4-2 as well as the final V in Okada’s defense mark before he passes Tanahashi for the most title defenses. They did a ton in this match. Tana hit the high fly flow to the floor, Okada hit the tombstone on the outside that he had been teasing throughout the build. This was incredible they do an incredible spot where Tana goes for the high fly flow right at the 30-minute call as a callback to their G1 Climax 26 match. They trade counters and signature moves and Tana hits the rainmaker for two. Okada goes for the rainmaker but Tana counters and starts to go towards the ropes for the High Fly Flow until Okada grabs the tights and hits a single rainmaker for the win. Post-match Okada challenges Omega for Dominion, no time limits, two out of three falls. This wasn’t quite as good as their MOTYC from the Carnival finals, but I still absolutely loved this match, probably more than most because I’m such a big Marufuji fan. Given we were in All Japan, Maru played heel here and did a great job of it. These two each take some wicked bumps and Marufuji hits his insane kick combos that I love so much. Maru hits the apron piledriver but Kento kicks out at two. As the two trade knees, I’m on the edge of my seat and Korakuen goes crazy. Kento hits the bridging German to get his win back from the Carnival. Dylan James makes the title challenge post-match. This match wasn’t for a title or anything, it was just an exhibition, but boy was it bonkers, and while it was just a shade below their EVOLVE title match that was the best match Mania weekend for me, I still absolutely loved it. The callbacks to their previous matches were great as Ospreay tried to beat Riddle at his own game. Ospreay goes for the rainmaker and Riddle catches him with disrespectful kicks a la the Shibata-Okada match from 2017, and Ospreay finishes Riddle with a Storm Breaker. These two had a full on sprint and this is must watch. The best match this year that has gotten almost zero buzz on a worldwide stage. Cagematch, a German-based website, doesn’t even have this in their match guide but this was absolutely brilliant. They told a story in this one after the True Colors match was littered with ref bumps. This match was entirely different from their 16 Carat match as WALTER hit like maybe three chops over the course of the entire match. The story was told that Ilja had gotten smarter as a wrestler and he worked over the hand of WALTER throughout the contest. Ilja hits Torpedo Moscow and WALTER rolls out of the ring (I love that spot). WALTER goes for the Gojira Clutch but Ilja bends the fingers to escape. WALTER resorts to his kicks because of his hurt hand. Ilja does WALTER’s spot where he hits the arms away from the ropes and delivers a German, and then WALTER hits Torpedo Moscow. WALTER finally hits a chop, and because there hadn’t been 1000 earlier in the match, it was a legit near fall. Ilja locks in an arm bar on the injured arm for the win. Absolutely incredible, and in my top ten of the year for sure. This is simple, five points for a ***** match, four for a ****3/4, three for a ****1/2, two for a ****1/4, and one for a ****, with your highest rated match as a tiebreaker.